Tribune Chronicle / Joe Simon Youngstown State University football coach Bo Pelini talks about the recruits who signed with the Penguins on Wednesday. 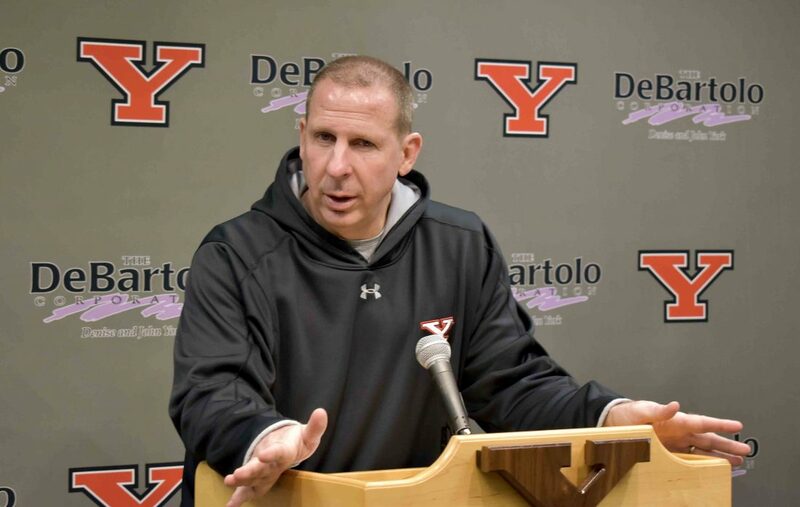 YOUNGSTOWN — Bo Pelini joked that he was going to bring a couple different hats to set on the podium for National Signing Day on Wednesday — a tradition he despises. Not surprisingly, he decided otherwise. Part of his decision may be because the Youngstown native is staying put. Pelini said Wednesday he and the university will soon put the finishing touches on a contract extension. He did not disclose the length of the potential deal, but he was adamant that it is a mere formality at this point. Pelini’s current deal expires on Feb. 28, but a new agreement should be in place by then. A mutual agreement seemed like a foregone conclusion once it was reported that Carl Pelini, Bo’s brother, returned to the coaching staff, a signing Bo confirmed Wednesday. The two coached together at YSU for four seasons before Carl joined Bowling Green State University to become its defensive coordinator in 2017. He returned after the Falcons fired head coach Mike Jinks following the 2018 season. With Carl at his side as defensive coordinator, Bo led the Penguins to the 2016 FCS Championship game. Carl will not be defensive coordinator this time around. Bo insinuated that Carl could be associate head coach, or “an extension of me,” as Bo put it. The retirement of special teams coordinator Ron Stoops led to running backs coach Nic McKissic-Luke taking over that role. No other changes were mentioned. Bo, who has two children currently attending Cardinal Mooney High School (his alma mater), said his return to YSU centered around his family. Pelini is 27-22 in four years at YSU. The Penguins start Spring Practices on Feb. 24. They open the FCS season, playing Samford on Aug. 24 in the FCS Kickoff on ESPN. The game is in Montgomery, Alabama.